Bust of Andy Warhol in Celebrity Alley in Kielce, Poland. Andrew Warhola, (August 6, 1928 – February 22, 1987), or Andy Warhol as he is known to the world, was an American renaissance man. Known primarily for his innovative paintings and artistic achievements, Warhol made a name for himself in the world of avant-garde film, music, publishing, writing, and acting. He helped to found and define the cultural Pop art movement that hit America during the 1950s. Though he is best remembered for his paintings of Campbell's soup cans, he also created hundreds of other works, including commercial advertisements and films. He was controversial, revered, and always daring. Andrew Warhola was born to Andrej (Andrew) Warhola and Ulja (Julia) Justyna Zavacka on August 6, 1928. His parents were both Slovakian and the family lived in Pittsburgh, Pennsylvania. He grew up in a very religious home, his family was Byzantine Catholic and attended Mass often. When Warhol was in the third grade he contracted St. Vitus' disease, which is thought to result from complications of scarlet fever. Warhol suffered greatly from the attacks of this disease, which caused involuntary muscle movement, on his nervous system. Warhol's appearance altered greatly and he became very self conscious of his looks. Warhol's father, Andrej, worked in construction to support the family, but he died in an accident when Andy was just 13 years old. Warhol was a creative and talented child who showed artistic talent early on. After high school he went to study commercial art at Carnegie Mellon University in Pittsburgh. He graduated in 1949 and immediately moved to New York City, where he became a successful magazine illustrator. He created his own style of art called "blotted ink" and soon became one of New York's most sought after illustrators, contributing to magazines like Vogue and Harper's Bazaar. In addition to commercial ads he also drew Christmas cards for Tiffany and Company, created book and album covers, and illustrated Amy Vanderbilt's Complete Book of Etiquette. His first exhibit was at the Hugo Gallery in 1952 and was titled, "Andy Warhol: Fifteen Drawings Based on the Writings of Truman Capote." From 1956 to 1959 his works were featured at the Bodley Gallery along with one show at the Museum of Modern Art. By 1962 he was doing shows in California. In the 1960s, Warhol moved into a studio which he named "The Factory" (the building used to be a factory). The Factory was lined with tinfoil and silver paint and was located in the heart of the city. It was from here that he made his assault on the New York art scene. When he wasn't at the Factory he was hanging out at "Serendipity 3" or "Studio 54." Warhol's works began to revolve around one main concept—Americana and American popular culture. His paintings were comprised of money, food, women's shoes, celebrities, newspaper clippings and everyday objects. His music, his writings, and his films all represented American culture and its values. 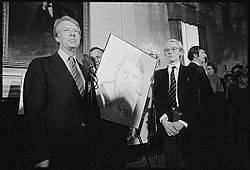 American president Jimmy Carter receiving a portrait from Andy Warhol at the White House in 1977. Andy Warhol helped to define the Pop Art movement that swept the United States. Tired of not being taken seriously for his "blotted ink" illustrations, Warhol decided to devote more energy to his artistic talents and become a "true artist." As a result he returned to painting, something he had not done since high school. Pop art was a new style of art that began in England in the mid-1950s and consisted of realistic renditions of popular, everyday items. Warhol took this new style and made it truly popular. Warhol began with Coke bottles and comic strips but this wasn't getting him the attention he felt he deserved. When a friend suggested that he paint the things that he loved, Warhol forged his way to fame with paintings of cans of Campbell's Soup, which he ate for lunch practically every day. He created 32 canvases for each type of Campbell's soup. His exhibit of these paintings became a big hit in California. From then on Warhol only painted what he loved, including money, shoes, and celebrities. Now that he had found his particular niche for his subject matter, he began to experiment with new production processes. He began eliminating the artistic hand made process and began to use silk-screening. This technique uses a specially prepared section of silk as a stencil, allowing one silk-screen to create similar patterns multiple times. He then began making paintings of celebrities, most notably a large collection of paintings of Marilyn Monroe. Warhol would use this style for the rest of his life. Warhol's life took a dramatic turn on June 3, 1968, when Valerie Solanas shot him in the chest. The wound forced him to wear a type of corset to support his back for the rest of his life. Solanas was the founder, and only member, of a "group" called the "Society for Cutting Up Men" (S.C.U.M.). She wrote a short work called the S.C.U.M. Manifesto. Solanas was arrested the day after the shooting,(coincidentally, the day that Robert F. Kennedy was shot), and when she was asked about a motive, she said, "He had too much control over my life." Warhol became much more withdrawn after the shooting and was more careful about the company he kept, but his brush with death began a series of artistic meditations on celebrity obsession. For the next three decades he focused on portraits of Jacqueline Kennedy, Elizabeth Taylor, Mick Jagger, Dennis Hopper, Mao Tse-Tung, Sylvester Stallone, and Michael Jackson, along with many others. Warhol's statement about celebrity, "In the future, everyone will be famous for 15 minutes," is as famous as his paintings are. Warhol also grew to dislike the way the media trivialized important events in human life, especially tragedies, so he also did a series of bright colorful paintings, including "Red Car Crash," "Purple Jumping Man," and "Orange Disaster." His art increasingly became commentary on American culture. Warhol did many paintings that involved religious themes that apparently stemmed from his Byzantine Catholic upbringing. His Skill paintings, the prints based on Renaissance religious artwork, his Cross paintings, and his large series based on "The Last Supper" all indicate a spiritual side to the man popularly portrayed as a contributor to the American society's cultural decline of the 1960s. Though most Christians despised Warhol, his art, and his actions, the pastor of Warhol's Byzantine Rite Catholic Church, Saint Vincent's, reported that Warhol visited the church almost daily. Religion became paramount in his later works and after his death several religious-themed writings and works were found in his study. His brother described Andy as "really religious, but he didn't want people to know about that because [it was] private." Despite the private nature of Warhol's faith, when art historian and Pablo Picasso scholar John Richardson eulogized him, he depicted Warhol as a devout man saying: "To my certain knowledge, he was responsible for at least one conversion. He took considerable pride in financing his nephew's studies for the priesthood." Warhol did a series of explicitly religious images from the 1970s and 80s—a series of silk-screened crosses, as well as reworkings of well known religious paintings (like Leonardo DaVinci's Annunciation, Paolo Uccello's St. George and the Dragon, and Raphael's Sistine Madonna). In 1986 by Warhol was commissioned by Milanese art dealer Alexandre Iolas, whose gallery was situated across the street from the original, to do a series of paintings based on the Last Supper. This series grew to encompass more than one hundred paintings. Warhol's Last Suppers are based on a line drawing of the Leonardo painting which appeared in a nineteenth century encyclopedia. From 1964 to 1968 Andy Warhol became consumed with writing and directing avante-garde films. Most of them were too shocking for the common movie-goer. Many of Warhol's films were unpopular, scandalous, and unsuccessful, but in 1966, his film, Chelsea Girls, became a seminal work in the world of film. Those who saw the film were amazed to see not one picture playing, but a split-screen showing two different captured images in tandem. Instead of one camera, Warhol used two 16 mm cameras to capture two stories and played them simultaneously on screen. It worked because of the use of the sound, while one film was focused on with sound and narrative, the other film was silent, and vice-versa. It was a complex and new process, with incisive detail needed for the sound management of both films in the projection booth. This unique process inspired future films such as Mike Figgins Timecode and even Fox's television series 24. 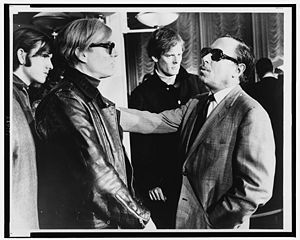 Warhol's desire to direct films came to a halt after he was shot in 1968. The highly reclusive Warhol left the company he had formed, Factory, to his assistant director Paul Morrissey. Once Morrissey was given full reign he took the film productions in a different direction, creating films that still had an edge, but were much more relative to the mainstream public, and therefore more popular. Some of Morrissey's films include Flesh, Trash, and Heat. Although these films were labeled with Warhol's name they were clearly Morrissey's projects. In fact, to help the success of the later films, the distribution of all of Warhol's earlier, avante-garde films was stopped by 1972. In 2005 many of Warhol's original films became available through DVD distribution. Crispin Glover portrays Warhol in the 1991 film The Doors (film)|The Doors, directed by Oliver Stone. Julian Schnabel's film Basquiat features David Bowie representing Warhol. In Mary Harron's 1996 film, I Shot Andy Warhol, the artist was portrayed by Jared Harris. Sean Gregory Sullivan depicted Warhol in the film 54 (1998). Guy Pearce portrays the artist in the 2006 film Factory Girl. Andy Warhol: A Documentary Film is the 2006 four-hour biographical movie by Ric Burnsabout Andy Warhol. Warhol was also highly adept at designing record album covers and his talents in this area were in high demand. He designed the cover art for two albums by The Rolling Stones, Sticky Fingers (1971) and Love you Live (1977). Mick Jagger was so impressed that he commissioned several portraits of himself in 1975. Warhol was friends with Bob Dylan and John Lennon, designing Lennon's album Menlove Avenue (released posthumously). Warhol's production company produced music videos for two hits by the Cars, Hello Again and Misfit. Wanting to experience even more in the music industry, Warhol took the band Velvet Underground and made them one of his projects. Trying his hand as a music producer for the band's first album The Velvet Underground and Nico, his "producing" simply boiled down to the fact that he paid for the studio time it took to record the album. The team fell apart after the album's release, when Lou Reed, the band leader, and Warhol disagreed about the band's future. Warhol designed the cover art for this album as well. Warhol's influence was recognized by various artists of the new wave/punk rock era, including the band Devo and David Bowie—who's song, "Andy Warhol" appeared on his 1971 album, Hunky Dory. Andy Warhol (left) and Tennessee Williams (right) talking on the S.S. France. World Journal Tribune photo by James Kavallines. Warhol's first book, 25 Cats was a very unique publication. There was a limited first edition printing of 190 hand-colored copies of this book on watermarked paper that used Seymour Berlin's specialized blotted line technique for lithographs. Warhol never sold these editions, keeping them instead to use for gifts to friends and clients. Later Warhol "wrote" several books that were commercially printed. A:A novel (1968, ISBN 0-8021-3553-6) is a literal transcription - (including all of the spelling errors and explanation of background noises) of Warhol's interactions with several of his close friends, among them Ondine, as they went about their parties, had conversations, and relaxed at the Factory. The Philosophy of Andy Warhol; from A to B and back again. (1975, ISBN 0-15-671720-4) Pat Hackett recorded her daily phone conversations with Warhol (with his approval) and transcribed the conversations, as well as recordings Warhol made himself of various conversations he had with other people, including Brigid Berlin (also known as Brigid Polk) and former Interview magazine editor Bob Colacello. Popism: The Warhol Sixties (1980, ISBN 0-15-672960-1), the book was written jointly by Warhol and Pat Hackett as a unique retrospective view and interpretation of the sixties and the prominent role of Pop Art throughout the decade. The Andy Warhol Diaries (1989, ISBN 0-446-39138-7, edited by Pat Hackett) was also comprised of Hackett's transcriptions of conversations with Warhol, who had started a "diary" of sorts to help him keep track of his expenditures, but it branched out to include his personal thoughts and observations. Warhol created the fashion magazine Interview, still in publication. It's signature cover title is comprised of a loopy script that is either one of Warhol's creations, or that of his mother, Julia Warhola, who often did text work for his early commercial pieces. In 1987 Andy Warhol was admitted to New York Hospital for routine surgery for his gallbladder. He was released from the hospital, but died in his sleep on February 22, 1987 at 6:32 a.m. The cause was attributed to a sudden heart attack. On further investigation, the coroners found that Warhol's body was flooded with several fluids. His I.V. had not been monitored properly at the hospital, and his body became overloaded, contributing to his sudden death. Warhol's lawyers, upon hearing the news, sued the hospital for negligence. Ironically, Warhol had put off his needed surgery because he had an acute fear of entering hospitals and being cared for by doctors. 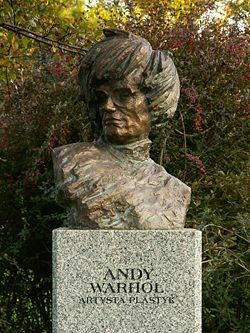 Warhol was buried back in his home of Pennsylvania. His grave is located at St. John the Baptist Byzantine Catholic Cemetery in Bethel Park, just south of Pittsburgh. Yoko Ono, among others, spoke at his funeral. Most of Warhol's possessions were auctioned off at Sotheby's over an extensive period of nine days and grossed over 20 million dollars. His estate was left to his remaining family, and was valued at far more. The Andy Warhol Museum is located in the artist's hometown of Pittsburgh, Pennsylvania. It is known as being the largest American art museum dedicated to a single artist. It houses more than 12,000 works by Andy Warhol. Another notable museum is the Warhol Family Museum of Modern Art, founded by John Warhol, Andy's brother, and the Warhol Foundation in New York in 1992. The museum is in Medzilaborce, Slovakia, located 15km away from the village of Mikova (where Andy's parent's were born). The museum houses several original paintings that were donated by the Andy Warhol Foundation in New York, as well as personal items donated by Warhol's relatives. This page was last modified on 20 March 2016, at 19:17.